The dominance of the GT2 Ferraris took the edge off the season for some of our panel, as did the predominance of one hour races in the British GT Championship. James Tucker’s Britcar package doesn’t get off scot-free either, the general quality of the entry and conduct of some of the races provoking some critical comment here. Back to the British GT Championship though, and the lack of MSV circuits was commented upon, Oulton and Brands being particularly missed by the teams and the fans. There was critical comment too for a perceived lack of effort from the organisers on development and promotion of the series. The reinstatement of the MSV circuits for 2006 will be welcomed of course, plus Avon promotion, but there is work to be done to rebuild competitor and paying customer confidence. And it is one aspect of this package that takes the withered laurels in this category. Just two years ago the GT3 category attracted entries from 10 different marques. 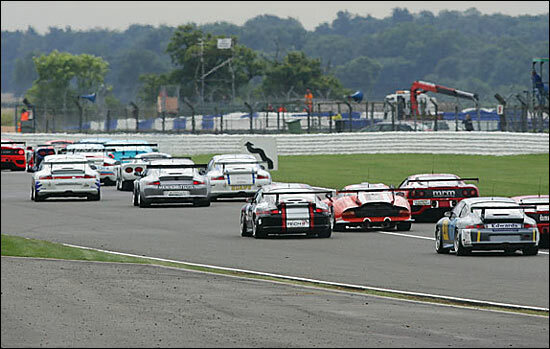 For 2005, the class was dominated by the ‘big two’ - Porsche and Ferrari - with just the Team Aero Morgan and the Team Tiger Marcos providing some variety. The BMWs Z3Ms fell by the wayside, leaving just a late season appearance from a Prosport 3000 to bolster the increasingly ‘Porky’ field - in referring to which, one member of our team remarking that he just couldn't get his head round some of the 911 teams, and how they switched and changed drivers, cars, personnel and names during the year. All sense of identity seemed lost. The loss of the Team LNT TVRs mid season was a hammer blow to the GT2 class too. The dailysportscar.com United Kingdom Disappointment of the Year 2005 was the lack of variety on the BGT grid.